Stay hydrated and stow your gear. Zefal’s Smart Light-Up hydration pack is an ideal way to stay hydrated and carry some essential gear while enjoying the outdoors. Now you can be seen in low light conditions. Simply turn on the LED panel on the back of the pack to increase your visibility to the surrounding world. It is constructed of durable ballistic nylon materials which has padded shoulder straps and back panel for all day comfort. The light-up LED panel provides high visibility with constant or blinking “Edge Light” technology. While an adjustable sternum strap holds the pack securely to you during vigorous exercise. 1 large main compartment with 2 internal zippered pockets and separate zippered hydration bladder sleeve allow you to easily carry extra food, tools, or other critical items to make sure that you have all that you need for your journey. Housed inside the zippered hydration sleeve is a 1.5-liter hydration bladder made of BPA free PEVA material insuring a clean and pure taste. A large 2in. opening makes it easy to fill with large ice cubes and easy to clean and dry after use. A 40 in. long hose keeps the high flow mouthpiece close at hand. A convenient dirt / dust mouthpiece cover keeps your mouthpiece clean in between drinks. The high flow mouthpiece has an incorporated automatic shut off valve to prevent accidental leakages. Overall, the Zefal Smart Light-up hydration pack is an excellent choice when heading out on an adventure. Zefal’s Sport 2.0 SMART hydration pack is an ideal way to stay hydrated while enjoying the outdoors on your bicycle. It’s SMART: 3 essential components designed to work together. Easy to hydrate, Easy to inflate, easy to be seen! The Bag is constructed of durable ballistic nylon materials. Padded shoulder straps and back panel provide all day comfort. While a 2-way adjustable sternum strap holds the pack securely to you during vigorous exercise. 2 large zippered main compartments (1 containing 2 small zippered pockets) allow you to easily carry extra food, tools, or other critical items to make sure that you have all that you need for your journey. The bag has 1 external mesh pocket to hold your cell phone or energy bars and a second external pocket that is designed to hold the Aluminum mini pump that comes with the bag. Also Included with the bag is a bright rear LED design to conveniently mount onto the lower portion of the bag to help increase your visibility to the traffic around you. Housed inside is a 2-liter hydration bladder made of BPA free PEVA material insuring a clean and pure taste. A large 2in. opening makes it easy to fill with large ice cubes and easy to clean and dry after use. A 40 in. long hose keeps the high flow mouthpiece close at hand. A convenient dirt / dust mouthpiece cover keeps your mouthpiece clean in between drinks. The high flow mouthpiece has an incorporated shut off valve to prevent accidental leakages. Overall, the Zefal 2-liter hydration pack is an excellent choice when heading out on an adventure. 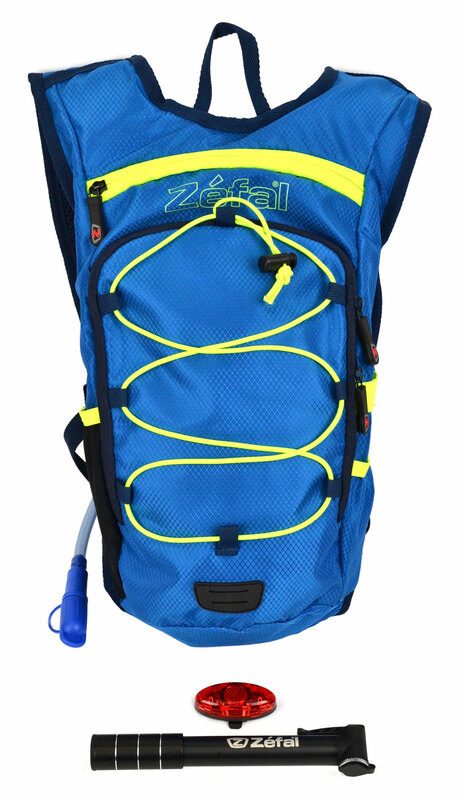 Zefal’s 1.5-liter hydration pack is an ideal way to stay hydrated while enjoying the outdoors. It is constructed of durable ballistic nylon materials and has padded shoulder straps and back panel provide all day comfort. While an adjustable sternum strap holds the pack securely to you during vigorous exercise. 1 large main compartment with an external zipper and separate hydration bladder sleeve allow you to easily carry extra food, tools, or other critical items to make sure that you have all that you need for your journey. The pack also has an external mesh pocket with reflective trim to conveniently hold your energy bag or a cell phone. Housed inside is a 1.5-liter hydration bladder made of BPA free PEVA material insuring a clean and pure taste. A large 2in. opening makes it easy to fill with large ice cubes and easy to clean and dry after use. A 40 in. long hose keeps the high flow mouthpiece close at hand. A convenient dirt / dust mouthpiece cover keeps your mouthpiece clean in between drinks. The high flow mouthpiece has an incorporated shut off valve to prevent accidental leakages. Overall, the Zefal 1.5-liter hydration pack is an excellent choice when heading out on an adventure.